The year was 1925 and, following the departure of Leslie Knighton, Arsenal (or ‘The Arsenal’ as they were commonly referred to) were looking for a new manager. The club were fumbling both in the league and financially, with Knighton leaving partly due to the excess pressure of having to operate under imperative instruction to spend as little money as possible. Sure enough, the Gunners advertised their vacancy in time-honoured fashion, by placing a classified listing in the local newspaper. 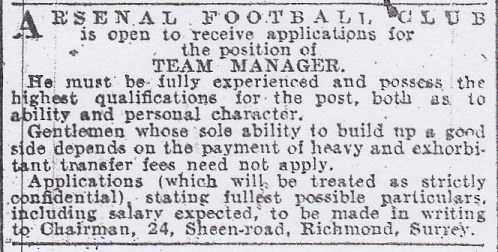 The advert above was posted in the Athletic News on 11th May, 1925 – with Arsenal putting the feelers out for a “fully experienced” professional, possessed of “the highest qualifications” for the role. Gentleman whose sole ability to build up a good side depends on the payment of heavy and exorbitant transfer fees need not apply. A parting shot across the bows at the previous boss? The tabloids must have had a field day. As it turned out, the successful applicant turned out to be one Herbert Chapman, then-manager of Huddersfield Town and a man whose statue still stands outside Arsenal’s home stadium to this very day. Suffice to say, Chapman didn’t do a bad job of turning things around, rejuvenating the club’s infrastructure from the ground up before winning an FA Cup and two First Division titles in the late 1920s and early 1930s.